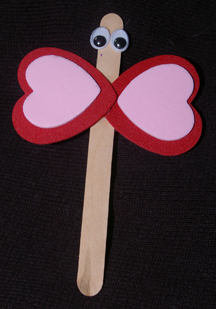 Preschoolers can present their love bug with this cute butterfly on Valentine’s Day. It’s quick and fun, and can double as a bookmark. What You Need: Popsicle stick (craft stick); 2 medium foam heats and 2 small foam hearts; 2 googly eyes; glue (foam glue works best). How to Make It: Glue small hearts inside larger one and then glue to Popsicle stick, overlapping slightly. Glue on 2 googly eyes. This entry was posted on Tuesday, February 12th, 2008 at 4:00 am	and is filed under animal crafts, foam crafts, Popsicle stick crafts, Valentine and heart crafts. You can follow any responses to this entry through the RSS 2.0 feed. Responses are currently closed, but you can trackback from your own site.